Description Analyze waveform similarity along a specified azimuth to highlight directional features (faults following a structural trend, channelized stratigraphic features). 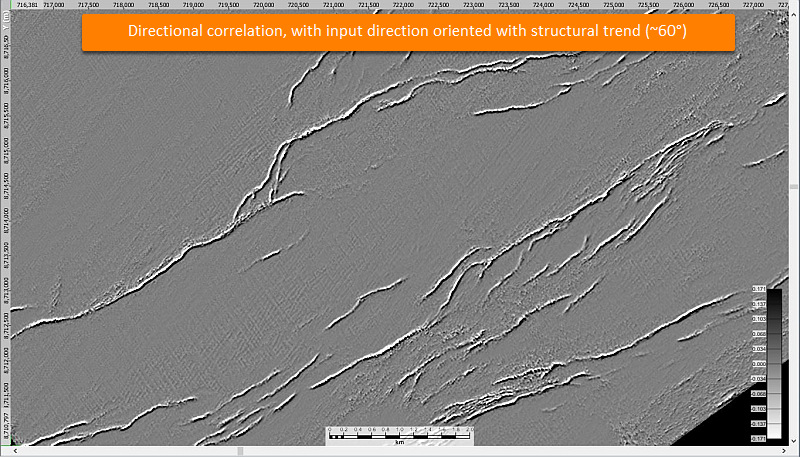 Directional correlation analyzes similarity between traces along a specified azimuth. This can be used to enhance the display of faults following a structural trend and channelized stratigraphic features oriented in a certain direction. Features along the user-specified azimuth will be enhanced while those oriented perpendicular will be suppressed. The resulting volumes are best reviewed as time slices in the Map View. 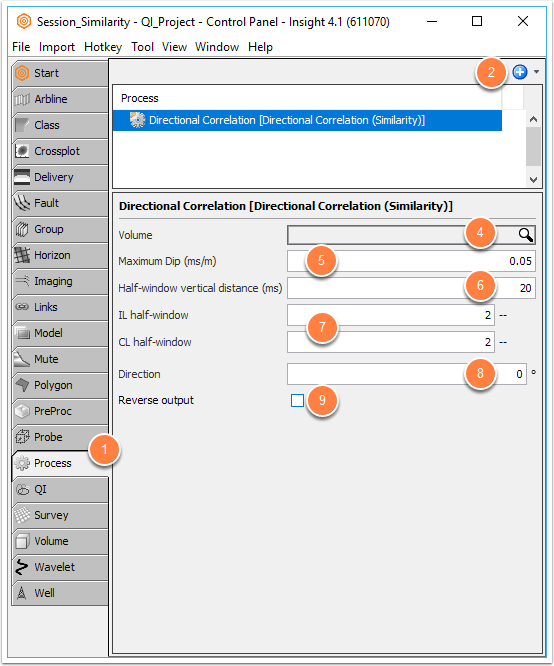 At each sample, correlation is calculated over the analysis window to neighbouring traces, biased in the specified azimuth direction. Maximum dip, vertical window size, and horizontal search area affect the size of the analysis window. Click the Add icon, select New Process, and double-click Directional Correlation (Similarity). Select the seismic volume for which you want to calculate correlation. At Maximum Dip (ms/m) or (m/m), enter the maximum dip of reflection events that Insight needs to allow. For example, an event with a dip of 4ms/m or greater will not be recognised as a "similar" event with a Maximum Dip parameter of 3ms/m. In this case, the event will appear as having high dissimilarity along its length. Note: A greater maximum dip angle will incur more processing time to generate the output volume. The Trace Half-Window (ms or m) defines the vertical calculation window. In general, the half-window length should be comparable to the feature of interest, but large enough to ensure it encompasses the feature. If the window is too small, the result will become noisy. If the window is too large, the result will have insufficient resolution. Any changes to this parameter is immediately reflected in the views. Note: Smaller windows display faster in map view, but take longer in section view, as more iterations are made. The IL and CL Half-Windows define the horizontal calculation window. The method for choosing the size of this window is similar to that for the Trace Half-window. The process performs best when the input is square (similar distance in IL and CL directions) and is faster with a smaller window. The Direction determines the azimuth at which the correlation calculation will be made. Discontinuities parallel to the specified azimuth will be enhanced while perpendicular features will be suppressed. Checking Reverse output will multiply output by -1. As a result of this process, a new volume is available in the Volume tab. It may be useful to display the "Directional Correlation" volume with the seismic volume it represents. To do this, you can group the "Directional Correlation" volume and the seismic volume to display them collectively (see Creating a Group). Tip: To quickly open the output volume, right-click the process item in the Process tab and click Open the output volume. Vice versa, you can also open the process from the Volume tab directly. To do this, right-click the volume which was created from a process (indicated in italics) and click Open the Process.